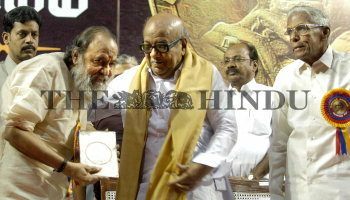 Caption : CHENNAI: Poet Vaali getting blessings from Chief Minister M. Karunanidhi at the launch of his book "Kalaignar Kaviyam" in Chennai on February 28, 2007. Also seen former minister R. M. Veerappan (right) and Information and Publicity Minister Paruthi Ilamvazhuthi (back). Photo: V. Ganesan.